Bring your junior Rocket enthusiasts out for a day of rocket launches and a mission to the Moon! 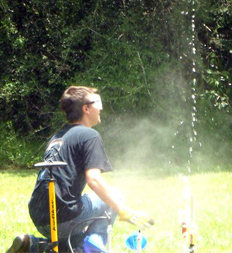 Kids learn about rockets and how they work, build a water rocket and then launch it. The rocket is theirs to keep! After the launches, we blast into space aboard the S.S. Observer for a simulated spaceflight. Kids become astronauts and use teamwork and problem-solving to accomplish their mission. The George Observatory is located inside Brazos Bend State Park.Park Admission fees: Adults and children over 12 years old are $7 per person; children under 12 are free. The mission is most appropriate for ages 7 and up. Children ages 7-9 need an adult present. Register here.